On Tuesday, November 11 Buckhorn will display American flags at their four entrances to honor all military veterans. Buckhorn’s college scholarship applications have been delivered to all the local high schools. Buckhorn resident high school seniors can pick up applications at their high school’s guidance office. The application deadline is February 28, 2015. In 2014, Buckhorn Homeowner’s Association awarded two $500 college scholarships and, depending on funding, it will try to award the same in 2015. The Buckhorn Homeowners Association Santa Claus Parade will be held on Saturday, December 13, starting at 2 p.m., and will proceed through most of Buckhorn’s main streets. There will be a fire truck, police motorcycles, Santa Claus in a separate car, and a car throwing candy to the children along the route. Buckhorn will hold its Santa At The Park on Saturday, December 13, starting at 3 p.m. at Buckhorn Park for all Buckhorn residents. Santa and Mrs. Claus will welcome Buckhorn’s children and their parents, and will be waiting the give gifts to the children who stand by Santa for a photo. Parents are reminded to bring their cameras for this free event. The Buckhorn Christmas Holiday Lights Judging Contest will be held after dusk on Sunday, December 21. Cash prizes will be awarded to the best lighted homes in numerous categories. For more information on Buckhorn, visit www.buckhorn.us. The homeowner’s association fees for Copper Ridge residents will be reduced by $30 for the year of 2015. This will turn out to be $82.50 each quarter. The Homeowners Board decided to reduce the fee with a suitable reserve that will cover 2015’s anticipated budget. 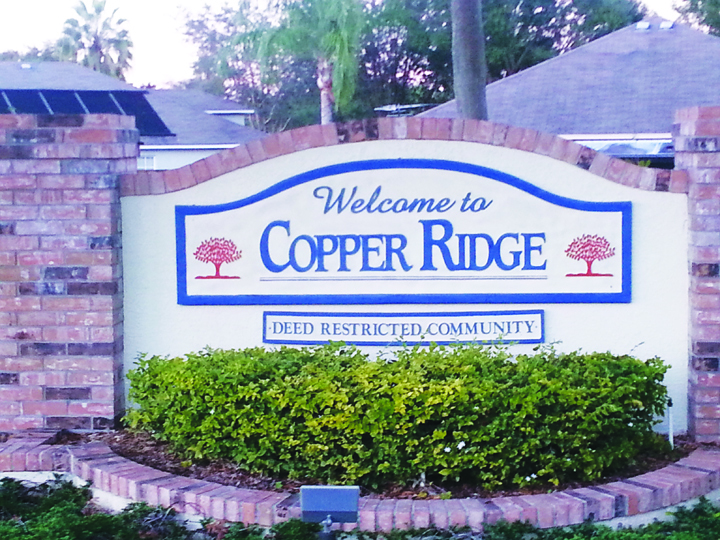 This will be Copper Ridge’s first reduction in fees since the neighborhood’s establishment. The next HOA fee is due by January 1, 2015. Brightly colored lights will be hung up at all Copper Ridge entrances for this year’s holiday season. Neighborhood board members have decided to add festive red, green and white lights to give the suburb a seasonal touch. This is the first year Copper Ridge has fashioned Christmas lights, and will be displayed by November. In addition to the entrance decorations, the board has a secret festive arrangement that will be presented in the neighborhood. Several thousand feet of damaged and falling wooden fencing will be replaced on the Lumsden extension, railroad tracks, and the Amber Ridge side of the community. In addition to the repaired fencing, several of the Copper Ridge community signs will be replaced or repainted. The signs have long suffered sun damage, years of weathering, and vandalism. Both projects will be underway before the end of the year. The Witt fencing company will be working on the fences and will give any homeowner the same discount as the HOA for those who would like to replace their fence. Keep in mind the discount rate will depend on how many homeowners book on the same day. Don’t litter in your community. Help clean up any litter seen while out on walks. Bring in trash bins on the same day of pickup. Do not park in the grass or block your neighbor’s driveway. For more information on Copper Ridge, visit www.copperridgehoa.com.